In the 1841 census, John and Flora and their two children are living in Trellech.� John is a grocer. By 1851 John and Flora are living in Skenfrith with children Flora and Frederick.� Their older son William has married and moved to America.� John has 95 acres that he is farming with three servants. Batch M036201 - Dates 1754-1851 Source Call No. 0856960 Film Printout Call No. 6911883. 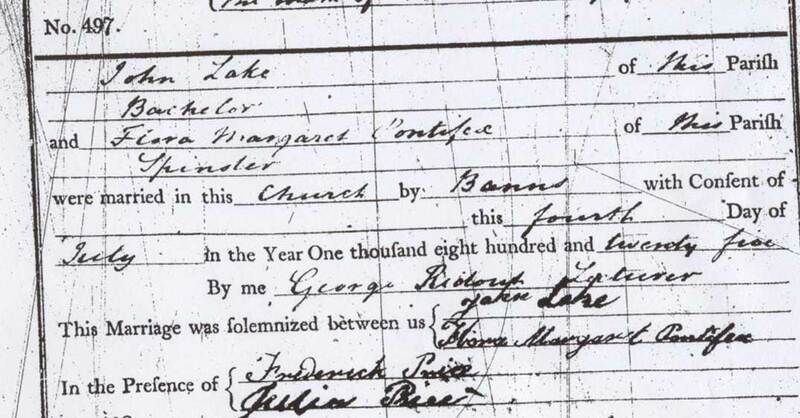 In 1907 letter from William Lake it states that his father John, married Flora Margaret onn the 19 of June 1825. Batch No. C022691 1725-1875 - Source Call No. 0104918 Fill- Printout Call No. 0820607. Source Citation: Ancestry.com. 1841 Wales Census [database on-line]. Provo, UT, USA: The Generations Network, Inc., 2006. Original data: Census Returns of England and Wales, 1841. Kew, Surrey, England: The National Archives of the UK (TNA): Public Record Office (PRO), 1841. Class: 1851 - HO107; Piece: 2444; Folio: 518; Page: 7; GSU roll: 104181.